The Walking Bostonian: Boston's narrow streets are safest for walking and riding a bike: wide streets are the most dangerous. Boston's narrow streets are safest for walking and riding a bike: wide streets are the most dangerous. A wide street, Brighton Ave: 80 feet wide. Chung-Wei Yang was killed by a bus here. But urban biking does present risks, especially in Boston with its narrow streets and aggressive drivers. In 2012, five cyclists were killed in accidents — though none in winter. This false, lazy sentiment about Boston's streets is unfortunately somewhat widespread. In fact, Boston doesn't really have many narrow streets. But, the narrow streets that Boston does have are one of its greatest advantages over other American cities. Even 24 feet is fairly wide (enough for two fast-moving traffic lanes), but that town did not have any smaller streets to study. Even without the research, it's easy to see that the main purpose of wide roads is to make it easier to drive faster -- and speed is the biggest danger to life and limb. One of the reasons New York City is having so many problems with street injury is because, other than a few, relatively small areas of Manhattan and Brooklyn, that city is cursed with extremely wide streets. Huntington Ave (courtesy: Google): about 95 feet wide. Kelsey Rennebohm was killed by a bus here. Boston is luckier in that it escaped the foolish 19th century fad for wide streets with much less damage. The oft-noted "cattle paths" (not really) of downtown Boston are not so problematic. There are some cases where arrogant city planners from the twentieth century actually tore down buildings and parks to widen streets, and that was unfortunate. But luckily we managed to save most of Beacon Hill and the North End from their depredations and those neighborhoods survive as examples of people-scaled streets. We are also lucky that when the Back Bay was built, the streets were not created as big as New York's -- although they are still quite a bit larger than they should be, and in some cases, quite dangerous. Beacon St and Charlesgate West: at least 100 feet wide. Kanako Miura was killed by a dump truck here. But Boston's narrow streets pretty much end after you leave the downtown area, Beacon Hill, and the North End. Outside of that scope, Boston has many wide streets, and many streets that are much wider than they ought to be. While many of the residential side streets are 24-30 feet wide, I still see many drivers using them as high speed cut-through routes. But the truly dangerous streets are the main ones, which around me range from 50 feet, to 80 feet, up to even 170 feet from sidewalk to sidewalk. 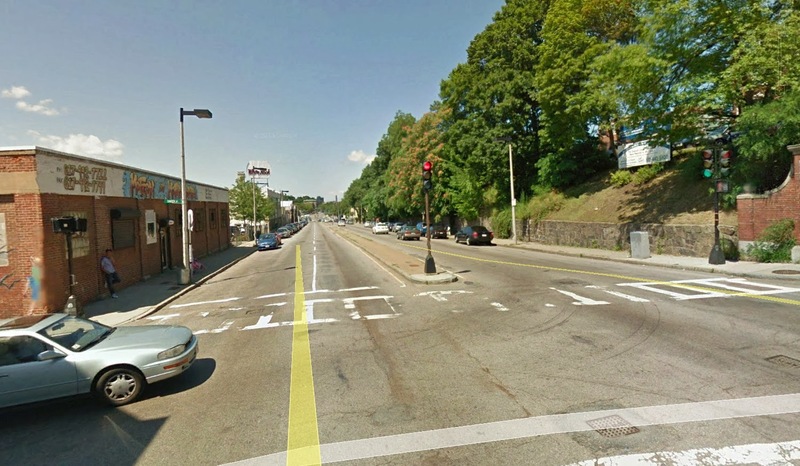 Comm Ave at St Paul St (courtesy: Google): about 110 feet wide. Chris Weigl was killed by a tractor trailer here. This is where the perversity of the Globe article quote comes into play: all of the people who were killed while riding their bike in 2012 were killed on very wide streets. Yet, the author blames "narrow streets." With such misinformation flying around, is it any wonder when people don't know better? Wide streets continue to be designed and built, on the premise that they are safer, when nothing could be further from the truth! One time, I asked an architect about why he was creating a new street that was so wide, next to a park where children play. He told me: but that's how it is in the South End, where I live! He didn't stop to think that the South End's wide streets were a danger and a drawback to living there. 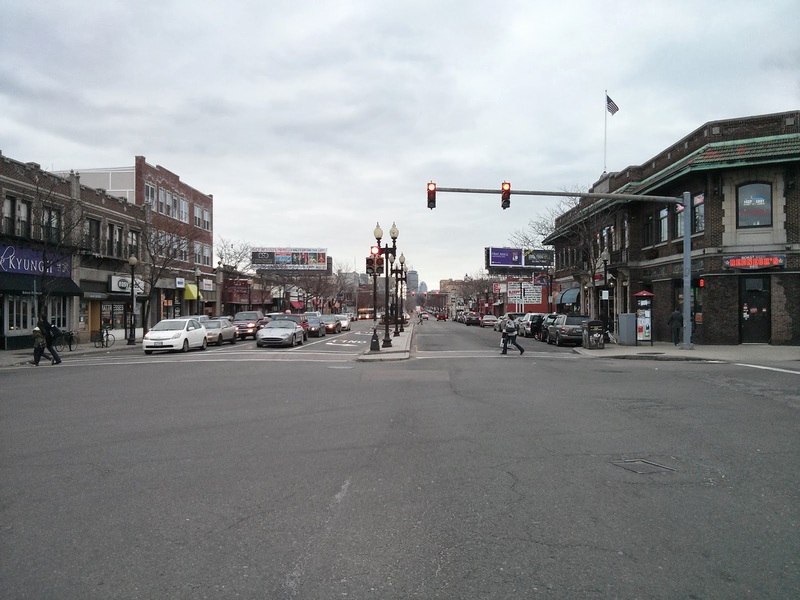 All of those streets are very wide except for Cedar St; a small side street that is one of the only ways to walk or bike between two densely populated residential sections of Roxbury, and requires crossing the very dangerous Columbus Ave between two very long blocks. Columbus Ave (courtesy: Google): about 65 feet wide. A woman was struck and killed here on Christmas Eve. I could keep going on and on, but I think I've made my point quite clear: wide streets are dangerous. 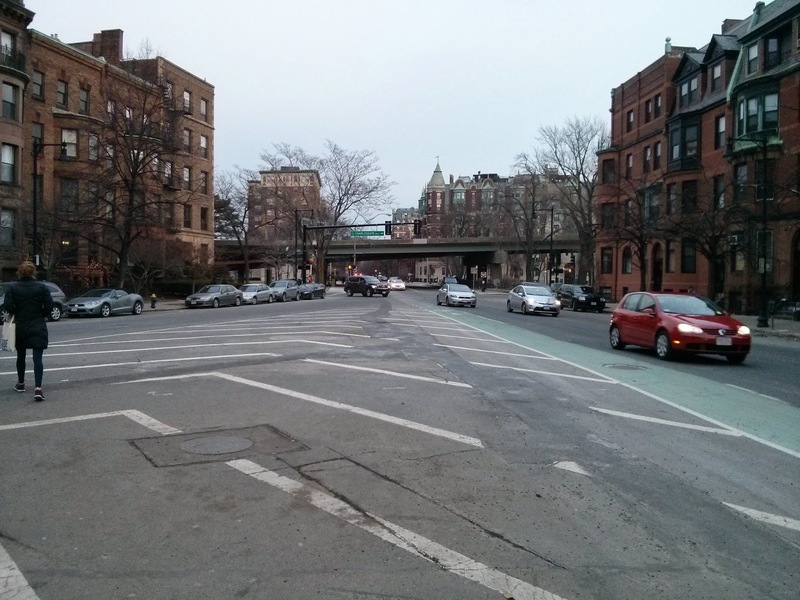 Unfortunately, Boston has many wide streets, and it is very difficult to fix them once they are created. The best way to create safer streets is to build them narrower from the beginning. But in the rare cases where we have that opportunity, we are still building wide streets because people do not know or understand the danger. Engineers claim to try and anticipate future traffic growth, and they do not consider the costs of the wider streets at all. Fire marshals want wider streets and turning radii for their trucks, but they don't think about the people who will be killed or injured by those design choices. Architects like wide streets because it feeds their egos: they're always trying to build the next "grand Parisian boulevard" and, at least in the bad old days, they could care less about the human cost. Even the new planners, with their "complete streets", tend to favor wider streets: to squeeze more stuff onto. That is unfortunate. Complete streets should be seen as a way to reduce the danger of overly wide streets, not as an excuse to make the mistake of building wider streets from the start. If we want streets to be safer in the future, what we really need is a program which encourages narrow, human-scaled streets, and also celebrates the narrow streets that we have inherited from the past.